Where old-world elegance meets modern luxury. We’re back at the Boca Raton Resort & Club to see what’s new and celebrate their 90th birthday. Since the last time we visited the property its undergone some substantial changes. This includes a dramatic 120M makeover to the 212-room Boca Beach Club and a 30M renovation to the Cloister lobby and guest rooms. The resort operates like a small utopian city unto itself and has it’s own mayor. One of the most interesting things we learned this time around is that the resort is actually a private club. Only members and guests have access to this Garden of Eden that’s situated on Lake Boca and the Boca inlet. The private club status has created a certain mystique amongst the Boca locals. They call it "The Pink Palace” and often wonder what’s it like just beyond the grand pink walls and stately Royal Palms that guard the main entrance. But in order to be an insider you’ll have to pony up 30K for a membership or arrange for a luxurious guest stay at the resort. It’s all about the guest card you’ll receive upon check-in. It gives you the same access and privileges as a private club membership. It’s your hall pass to a luxury lifestyle that’s over-the-top. Get ready to be wined and dined and relax poolside at the beach. 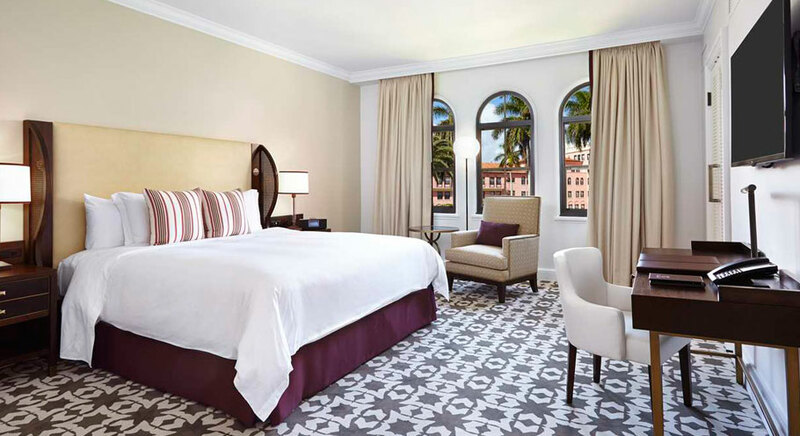 Come and experience what it’s like to spend a couple of days at the Boca Raton Resort & Club with us. It’s a par excellence stay where the Great Gatsby experience of yesterday blends seamlessly with the modern luxury lifestyle of today. You can’t talk about the Boca Raton Resort & Club without mentioning its benefactor Palm Beach architect Addison Mizner. He was an eccentric visionary who built the Spanish-Mediterranean style resort in 1926 and often walked the grounds with his pet monkey Johnnie Brown. You can pay tribute to him and his best friend at The Monkey Bar by ordering Brian Fleury’s Southern Hospitality cocktail. It’s made with Bourbon, muddled blackberry and mint, topped with fresh lemon juice. Once you’ve had a chance to enjoy some Southern hospitality you’ll notice that the Cloister lobby has undergone some significant changes. The dark timber framed ceiling has been renovated with intricate contemporary white crown molding treatments that dramatically brighten the space. The Rothko inspired carpeting that used to cover the classic Mediterranean terra-cotta tile floor has been replaced by a matching slate and marble inlay that balances the space perfectly. The enormous central hall now exudes sophistication and elegance. It’s chic without being pretentious. Waldorf Astoria got it right this time around. They have seamlessly updated the resort’s old world charm with elegant modern day treatments the sophisticated traveler desires. 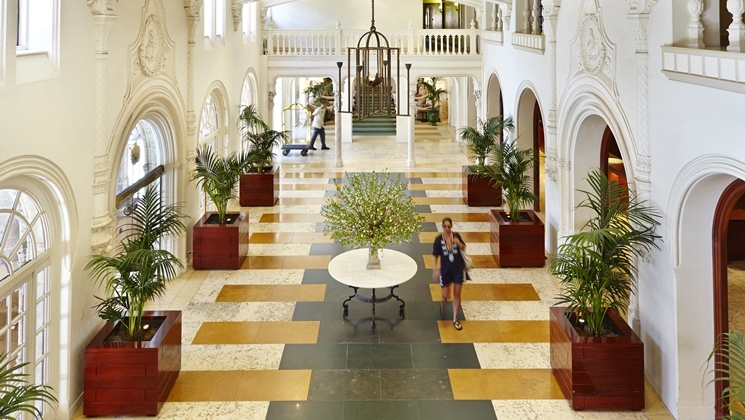 This iconic Cloister building has 361 guest rooms and suites and is centrally located at the heart of the property. When you stay here you’ll only be a few steps away from the Waldorf Astoria Spa, two championship golf courses and a tennis facility that’s home to the Jimmy Connors Tennis Academy. All of the rooms and suites have been renovated by Richmond International Designers from London at a cost of $100,000 per room. The project dictated that each room be gutted and remodeled. This included new sheetrock, crown moldings, carpeting, lighting, bedroom furniture and a 50” flat screen TV. The bedroom interiors use a warm color palette that is accented with tropical floral prints. The modular glass paneled closet has two built-in chest-of drawers, hanging bar and upper and lower shelves. There is also an adjoining mini-bar that’s equipped with a fridge and various snacks.